Las Vegas themed weddings is a fun and memorable way to tie the knot! The fantasy of wedding planners has no limits - they created so many theme packages, some of which you couldn't imagine existed. From the ever-popular Elvis Presley themes to Intergalactic and Egyptian ceremonies, only in Vegas your wedding fantasies come true! 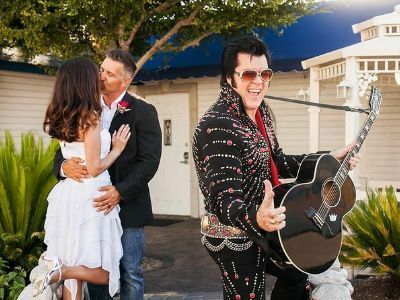 Elvis packages are, hands down, the most popular Las Vegas themed weddings! There are plenty of Elivs themed wedding packages that vary in price and scope. Browse below some of the most interesting and fun packages. Celebrate your wedding with the glamor and style of the 50's, 60's and the Disco era in Las Vegas. The wedding package includes a beautifully decorated chapel, music from the era and gorgeous fog and lighting. Add even more glamor to your wedding with Donna Summer or Cher at your wedding. 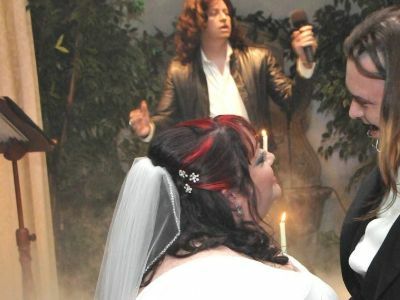 If you are a fan of Alice Cooper, Viva Las Vegas offers the perfect opportunity to celebrate the most important day in your life with an Alice Cooper Las Vegas themed wedding package. From beautiful décor and music to match the mood, this package takes care of every little detail, including an Alice Cooper impersonator. The Beach Party Las Vegas themed wedding package at Viva Las Vegas is the perfect option for couples that love the relaxed beach life. The package includes gorgeous showgirls in bikinis, muscle men carrying the bride to the aisle and a beautiful Beach Chapel venue as well as music from the Beach Boys. Celebrate your wedding with the style and elegance of James Bond with the Bond Las Vegas themed wedding. The bride and groom are picked up in a sleek limo. Entertainment is provided by a true lounge singer and a dancing Bond Girl after the ceremony. 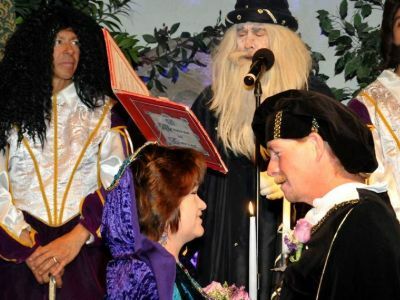 A Camelot themed wedding in Las Vegas will allow the bride and groom to tie the knot in front of a King Arthur or Merlin the Magician minister. This package has many authentic details like knights and period music as well as beautiful ceremony prints to capture the memories of the special day. Be a true king and queen for a day with an Egyptian Las Vegas themed wedding. The ceremony will be performed by King Tut while the bride will have two male slaves to carry her to Cleopatra's Throne. The groom too would be entertained in style with an Egyptian goddess dancing for him. Godfather fans can now celebrate their wedding in true Godfather style with the Gangster Las Vegas themed wedding. The stage is set with theatrical lighting and fog while the décor and music are carefully chosen to suit the theme. This package also includes Italian waiter and the ceremony is performed by Godfather. The Gladiator themed wedding package in Las Vegas offers couples the perfect way to add some drama and fun to their ceremony. The ceremony is performed in the chapel by Gladiator as the minister. With fog and theatrical lighting, photographs and video, this package includes everything couples need for their ceremony. 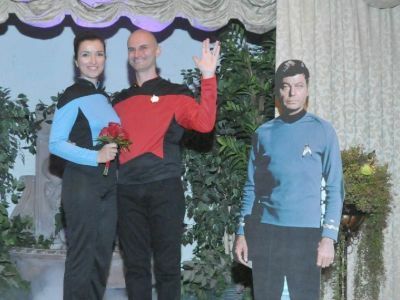 If you love something unique and quirky, the Intergalactic Las Vegas themed wedding is a great option. The minister for the ceremony is none other than Captain Quirk. This package offers the use of a chapel free of charge along with photographs and video of the ceremony. 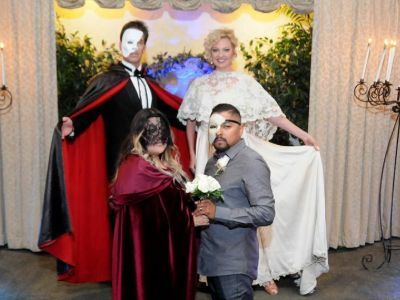 With the Phantom themed wedding in Las Vegas, couples will have a wedding ceremony they won't soon forget. The ceremony is performed at the Phantom Chapel by the Phantom himself. The chapel is appropriately decorated with lit candelabra, theatrical lighting and fog. An organist will play for the ceremony to set the stage. 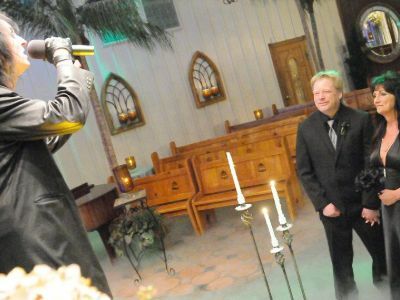 If you plan to tie the knot in Las Vegas, a Pirate Wedding will be a memorable and fun option. 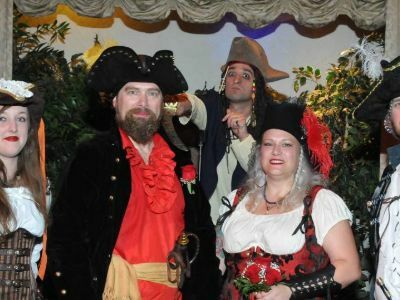 The Pirate Las Vegas themed wedding package includes free use of the chapel, limousine service, video, photographs and much more. The theme is carried out with fog, lighting, décor and music. The ceremony itself is performed by the Pirate Captain. Celebrate your wedding with the music you've always loved. The Rock n' Roll themed Las Vegas wedding package will make you feel like a rock star for a day with great music and beautiful décor. A rock star will perform the ceremony while photographs and video of the ceremony will capture all your beautiful moments. The Hollywood Starlet Las Vegas themed wedding package will bring old world glamor and class to the most important day of your life. The ceremony will be performed by a Blonde Goddess Impersonator who will also sing for the couple and the wedding guests after the ceremony. The Thriller wedding package is a real treat for Michael Jackson fans. Theatrical fog and light will make the venue feel like a true concert. MJ will not only be the minister but will also sing songs after the ceremony for the guests and the newlyweds. Music will be the highlight of this wedding package. 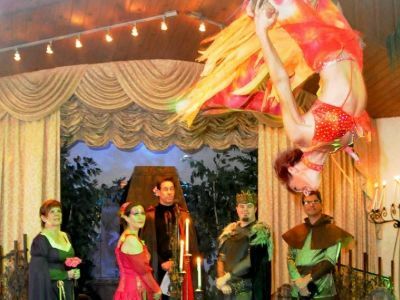 The Viva du Cirque themed Las Vegas wedding package includes all the facilities couples need to make their wedding day special. The ceremony will be performed in the beautiful Main Chapel of Viva Las Vegas. The package includes free wedding invitations or a wedding website, video, ceremony photographs and bouquets. 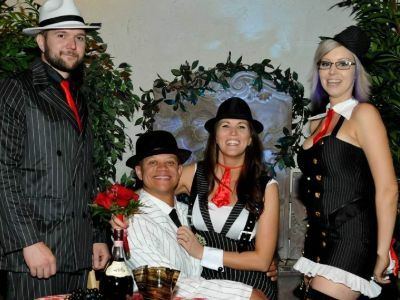 The Western Las Vegas themed wedding offers good, wholesome fun for the bride and groom as well as their guests. The ceremony is performed at the Vegas Hitching Post by a Western Cowboy or Old Miner minister. Guests also perform a line dance at recessional. Music for the ceremony is provided by a Western Soloist. 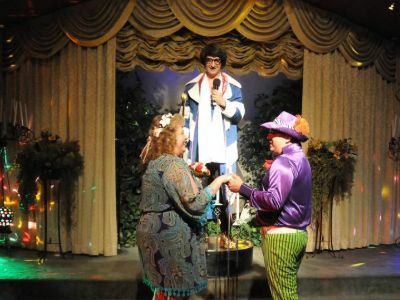 For Woodstock fans, Viva Las Vegas offers a special Woodstock wedding package. This wedding package offers the free use of the beautifully decorated Woodstock Chapel with special stage lighting. A boutonniere and Colonial bouquet are provided for the occasion along with photographs and a wedding video. 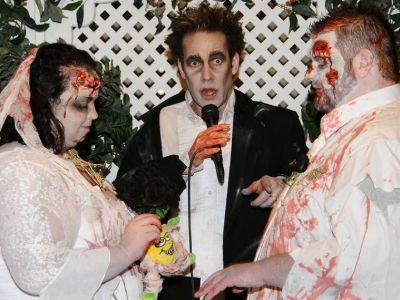 The Zombie themed Las Vegas wedding package is perfect for couples with a sense of adventure and a liking for the unique. The package provides unique décor and music that suits the theme. Even the ceremony is performed by a Zombie minister and the effect is completed with theatrical fog and lighting.